St. Francis was born in the hill country of central Italy in the town of Assisi around 1181. He was theonly child of a prosperous cloth merchant, and grew up among the privileged sons of the town’s wealthy families. His early youth was given over to a lively social life and dreams of knighthood to be won in the City’s wars. He returned from his military service a changed man, and withdrew from his friends and former amusements in search of a new life. While praying in the ruined church of San Damiano in the countryside, he heard the words: “Francis, rebuild my Church which you see falling down.” Taking the word literally, he began to rebuild the little church with his own hands, begging in the streets for building supplies. This public humiliation led to a permanent break with his father. Francis gave away to the poor everything he had ever received from his family, even the cloths on his back. He embraced the poverty of the gospel, “sell what thou hast, give to the poor, and come and follow Me.” Francis soon discovered that his calling was not to renew merely a church, but the Church. Others soon joined Francis, many from the elite sons of the city, and a community of brothers–friars–formed around him. In contrast to the comfort of the established monasteries and clergy, the first Franciscans lived in utter poverty among the poorest of the poor. Traveling through the towns and villages, Francis preached the gospel pax et bonum–“peace and good will with all people.” His preaching was simple, but filled with an unaffected joy and excitement which cut across class and political divisions. Encountering him, people found their lives changed, feuds were healed, and a new spirit of devotion stirred in the churches of Italy. 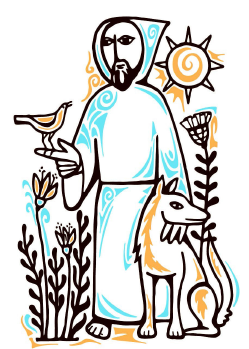 Soon stories of miracles, many involving his affection for animals, began to surround Francis. In 1210 the great pope Innocent III recognized Francis’ community Rule, consisting only of texts from the Gospels, and the Franciscan First Order, the “Friars Minor” or “little brothers.” By the time of his death there were over 10,000 Franciscan brothers spread across Europe, apostles of a general renewal of the Church. The greater Franciscan community included a women’s Second Order nicknamed the “Poor Clares” after St. Clare, the first Franciscan sister, and for the first time in history a Third Order with a simple Rule adapted for regular lay people committed to service, charity, and simplicity of life. Francis spent his last years feeling that his Order had grown beyond him, and turned more and more to interior solitude. Two years before his death during a visionary encounter with the glorified Christ, he received the “stigmata”, the five wounds of the crucified Lord, another first in Christian history. He was popularly acclaimed a saint in his own lifetime, and formally canonized only a year after his death in 1226. Today there are both Roman Catholic and Anglican Franciscans at work across the world.